When my sister was redecorating, she gave me her CD shelf. I never intended to house cds in it, as I thought that this would be a great shelving unit in a narrow spot. I found the perfect place for it in my closet, between two shelving racks. However, I was not using it at its full potential. I have always wanted to repurpose it better, but then lack the inspiration to do so. Now a year later, I have been motivated to do make it more functional. I have been looking in various places for containers/ baskets that would fit, but could not find something I liked for the price I wanted. Inspired by my box with light yellow flowers, I decided to look for boxes around my house that would fit in the shelves. I was able to find a few boxes that I have been saving to use for wrapping presents. Using a butternut paint spray can that I have (this worked out quite well, because that is the only paint can I have), I sprayed all my boxes the same colour. I looked through my stash of ribbons that I had saved from projects or gifts that I had received, and found a lovely piece of green and yellow ribbon that I had bought from the thrift store for 35 cents. 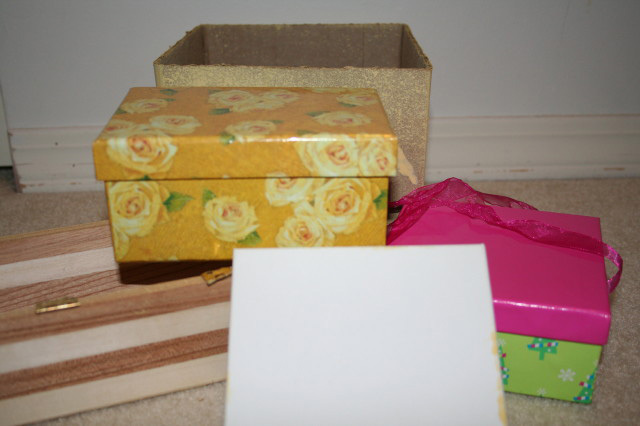 The yellow on all the containers, tied everything together and the ribbon, was an accent for some of the boxes. Not everything was matching, but there was a connection that ran through all the shelves. I used a glass vase that I had, to put some of my soaps (which co-incidentally are yellow as well), to add another decorative element. The different boxes on the shelves, have helped me become more organized. I now have items placed neatly and they are easy to find. But above all, I have something visually pretty to look at and inspire me while I figure out what to use for work. This project cost me next to nothing, and has been a great way to use items around the house. Each time I look at my shelving unit, I feel a touch of luxury. This has certainly made me happy. Do you have items in your house that can be re-purposed to help you get organized?